If I need to name my strengths, perseverance and persistence are definitely among the top ones. They are quite useful qualities also in the worlds of blogging and cooking. 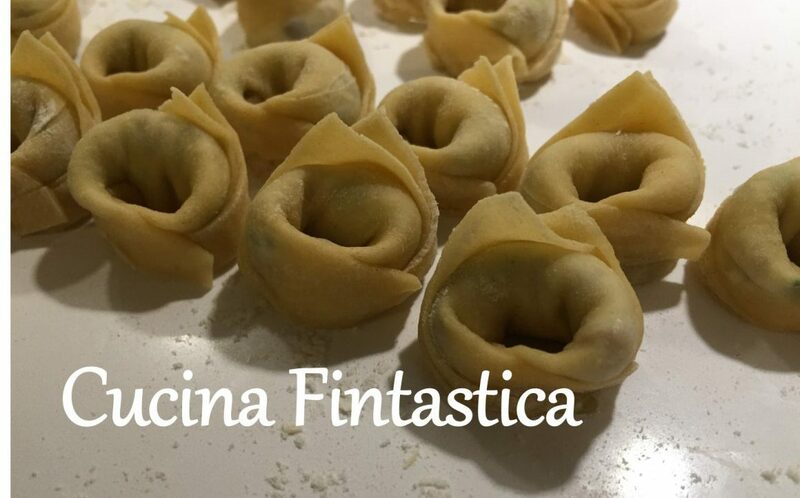 They enable me to write yet another post to Cucina Fintastica after a …er… lengthy break. They also make me re-try recipes even if the first experiment resulted in a kitchen disaster of some sort. As you may remember, I have had my fair share of them. Like this. Or some of these. Today’s dish is another example of a dish gone unfriendly at the first attempt. When I had mixed all the ingredients of the gnocchi together, I had a pasta dough so wet and sticky that you could have probably very successfully used it for hanging a wallpaper. However, for making fresh pasta it was completely useless. So I added flour. And more flour. And more and more. I ended up with something not so useful for decorating your walls anymore and managed to make the pieces of pasta out of the dough. Unfortunately after all the extra rounds of flour, the gnocchi tasted of – not too surprisingly – flour and were very hard. Apparently I am not the only one who has miserably failed in the art of gnocchi-making. According to this article by La Cucina Italiana, there are several errors that you can make. You have to pick the right kind of potatoes, not peel them before cooking, avoid using too much flour and so on. My first failed attempt did put me off potato gnocchi for quite some time though. Then I dared to test a version of them with pumpkins (no potatoes) which worked out quite perfectly. Another success was gnocchi of ricotta (still no potatoes). Finally I tried gnocchi alla sorrentina with a shortcut of using ready-made gnocchi. In fact, I was going to take the same shortcut today but my not-so-well-equipped supermarket didn’t have any ready gnocchi available. Hence I was forced to bravely crawl out of my gnocchi comfort zone. And I’m glad that I did. This time I selected the right potatoes, tapped the potatoes dry with papertowel and didn’t add the entire egg when my dough started to show signs of stickiness. And voila, the gnocchi had proper taste and consistency! Another culinary lesson learned. Cook the potatoes in boiling water until soft (depending on their size for about 30-40 minutes). In the meantime, prepare the tomato sauce. In a pan, heat some olive oil and add the garlic clove and tomato paste and season with some salt. Add the basil leaves and cover the pan with a lid. Cook on a low – medium heat for at least 30 minutes. When the potatoes are cooked, drain them very well. Put the flour on a board. Peel the still warm potatoes and manually mash/ puree them. Combine them with the flour. Add the egg and a pinch of salt. Start kneading the mixture until you have a homogenous, soft (not too sticky nor too hard) dough. Boil some water in a kettle to cook the gnocchi. Add some salt. Make the gnocchi out of the dough. Form long “sticks” of the dough on the board. They need to be 2-3 cm thick. With a knife, cut small chunks (1-2 cm wide) of the stick and form a gnoccho of each with a fork. In the original recipe, there are some good pictures how to do this in practice! Use some extra flour all the time in case the dough or the gnocchi get stuck. Cook the gnocchi in several parts (to ensure the won’t break) in the boiling water for about 2-3 minutes. Take an oven dish and spread a small amount of the tomato sauce and sprinkle of olive oil at the bottom. Mix the remaining tomato sauce with the cooked gnocchi (again careful not to break them). Slice the mozzarella and grate the parmesan. Add one half of the gnocchi in tomato sauce to the oven dish. Put one half of the cheeses on top. Add the remaining gnocchi and finally the remaining cheese. Bake in the oven at 250C for about 5 minutes.